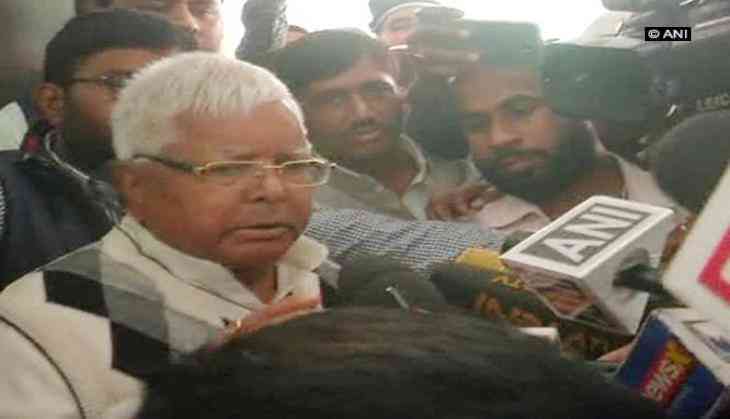 Home » national news » Fodder scam verdict: Lalu urges people to maintain "calm and peace"
Fodder scam verdict: Lalu urges people to maintain "calm and peace"
Confident of getting justice in the fodder scam case, former Bihar chief minister and Rashtriya Janata Dal (RJD) chief Lalu Prasad Yadav, an accused in the case, on 23 December urged people of Bihar to maintain "calm and peace" after the judgement is delivered. "I have faith that I will get justice. Whatever is the judgment, I appeal to people of Bihar to maintain peace and law and order," Lalu Prasad said while interacting with the media here. A special CBI court in Ranchi will pronounce its verdict today in the case. Earlier in the day, Prasad's son Tejashwi Yadav expressed confidence that his father will come out clean in the case and alleged that the entire matter was a part of the Bharatiya Janata Party's (BJP) propaganda to pull the RJD down. "We trust the judiciary and hope the verdict will be in our favour. We hope that justice will prevail. Just like BJP's propaganda was busted in the 2G scam and Adarsh scam, a similar verdict will happen now," he said. Tejashwi accused the BJP of practising vendetta politics. "We trust and respect the judiciary. We will not let BJP's conspiracies work," Lalu said, adding that he would get a clean chit in the fodder scam case like other accused in the 2G and Adarsh scams. The fodder scam case relates to the alleged fraudulent withdrawal of Rs 95 lakh from the Deoghar treasury. Overall, more than Rs 900 crore was reportedly siphoned off from the Chaibasa treasury for two decades. Altogether, there were 34 accused in the case, out of which 11 died during the course of the trial and one turned CBI approver and admitted the crime. Former Bihar chief minister Jagannath Mishra has already been convicted and sentenced to five years of imprisonment in one of the five fodder scam cases.